Russia should not lose momentum gained in country’s aircraft construction, Russian Prime Minister Dmitry Medvedev said Wednesday. IRKUTSK (Russia), Earlier in the day, Medvedev visited Irkutsk Aviation Plant within the framework of presentation ceremony of Russia’s new advanced MC-21 aircraft. “You have gained a really good momentum and it is crucial that we can not lose it, because it always results in loss of skills and just because we should rearm our army,” Medvedev said, during his visit to Irkutsk Aviation Plant. Medvedev also thanked everyone involved in construction and maintenance of advanced aircraft, adding that Russian planes successfully cope with different challenges, including such complicated as anti-terrorist aerial campaign in Syria. Meanwhile, the head of the United Aircraft Corporation said that sales of MC-21 airliners with the latest Russian PD-14 engines will begin in 2019. “MC-21 will replace the Tu-154 fleet, Tu-134, Yak-42, which are actively used by the Defense Ministry, the Federal Security Service, the Emergencies Ministry. Of course, this is very important, because all these agencies will use aircraft with the optional PD-14 engine starting 2019,” Yury Slyusar said. “PD-14 will be certified in 2017, we will devote two years to a flight test program. So far the PD-14 program is going according to schedule. We hope for a more economical and cost-effective engine,” he added. 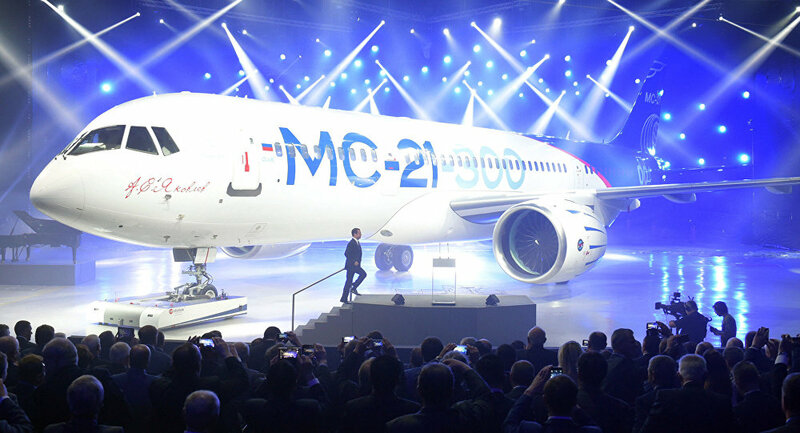 The MC-21 is a Russian twin-engine short- and mid-range airliner with a capacity for 150-212 passengers. The first planes in the new series are set to be delivered in the end of 2018.